Update 9:30AM Found the hound! Thanks to several Beach Drive neighbors… Charlotte, Judy, Kevin, Jeff, guy with stroller, lady with dogs, passing cars with sightings, etc. 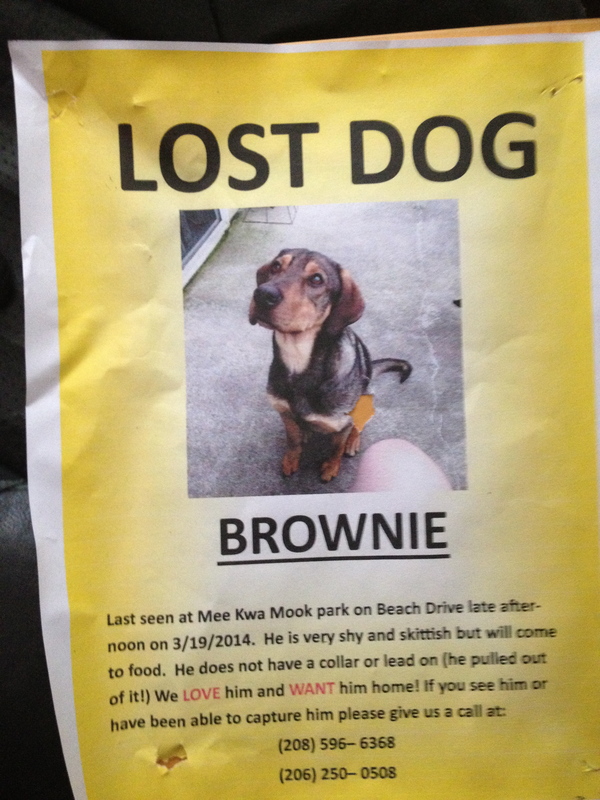 we managed to track Brownie down and reunite him with relieved owners. Reports are coming in of a puppy who looks to be about 40 pounds and a lab-sheppard mix, running scared around Jacobson and Beach Drive. He is too frightened to come when called. THANK YOU EVERYONE! We feel so blessed to live in such a wonderful community. Brownie is home sleeping like the dead! He is going to the vet today to treat his paws (sadly they got wounded). Once again We want to thank everyone who posted, watched, looked, and notified us with any updates! THANK YOU!!!!!!!! !